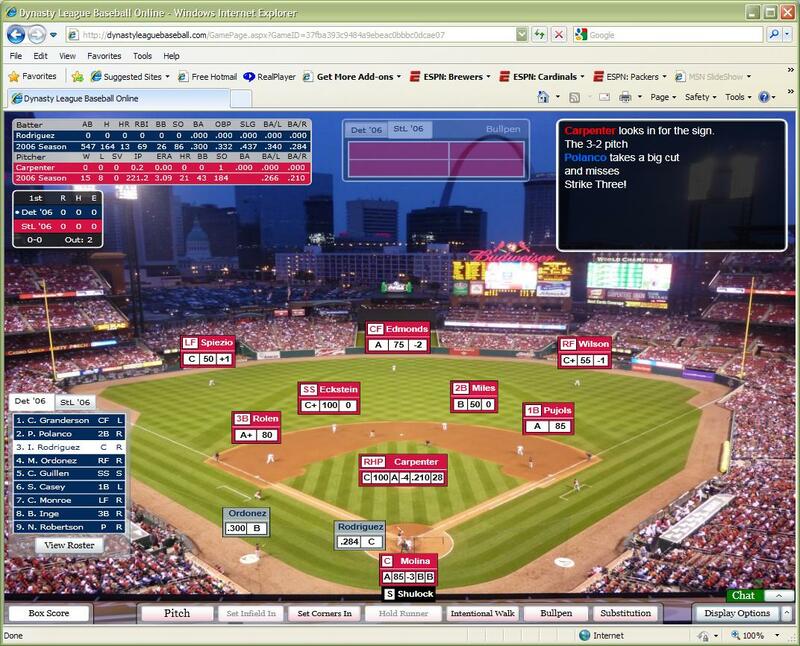 Ready to become the GM in a DYNASTY League Baseball Online league? Rosters are set at 25 players. 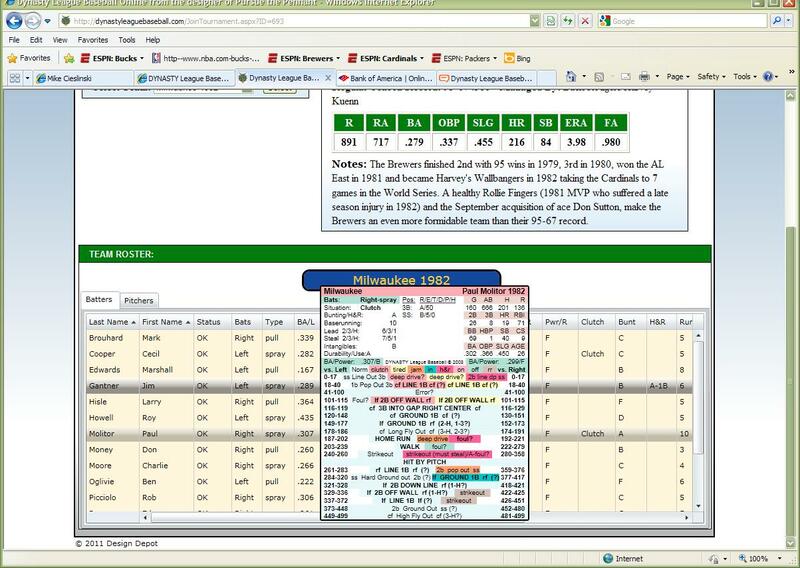 Rosters expand to 40 players when your league simulation month reaches September. You can fill a lineup vs. both a right-handed and left-handed starter. You have a starting pitcher available for your next game. You may move anyone from the active roster to the minor leagues at any time, unless they are suspended. Before your first game of the season, your roster may be set without any penalties. Any time during the season, any player moved to the minors must stay there for 10 days before they are eligible to return to your active roster unless they are replacing a player that is placed on the DL. Any injured player can be moved to the disabled list. Players placed on the DL must stay there for 15-days, retroactive to the day after their injury. You can have an unlimited number of players on the DL. Players that have a percentage value listed as their USE value may only be on the active roster for that percentage of the season. So in a 54-game season, a 30% use player can only be on the active roster for 16 games. Percent Use players MUST serve their time on the active roster contiguously, meaning that once they are sent down to the minors they cannot return to the active roster. Often Percent Use players were mid or late-season callups. Batters that have values for Use vs RH or vs LH are restricted to a certain number of at-bats against pitchers of the specified throwing arm. These values are pro-rated for the length of the season you are playing. So in a 54-game season, a player with a use vs RH of 51 can only have 17 AB against right-handed pitchers during the season. Players with Use values of less than 20 are not eligible to start OR pinch-hit against a pitcher of the specified throwing arm. Players must have at least 3 AB remaining to start against a pitcher of the specified throwing arm. Players must have at least 1 AB remaining to pinch-hit against a pitcher of the specified throwing arm. If you insert a player into the game who has 0 AB remaining against the throwing arm of the current pitcher, you will be forced to remove that player the next time he comes to bat. Pitchers who have a Spot Start value are limited in how many starts they can make. This value is pro-rated for the length of the season you are playing. So in a 54-game season, a pitcher with a spot-start value of 6 can make 2 starts.